A Feature Packed Sit On Top Fishing Kayak With Great Stability And Performance To Match. The Feelfree Moken 12 Angler is a 12ft sit on top kayak designed with anglers in mind. 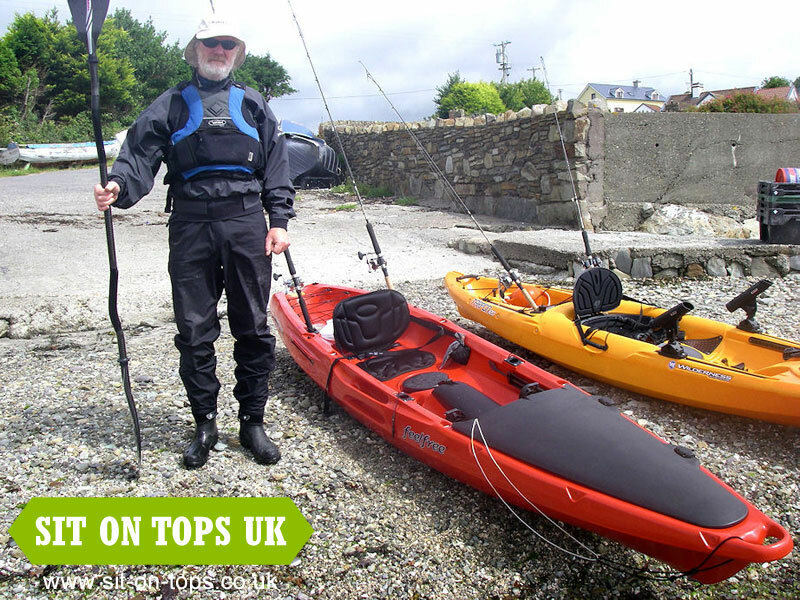 This feature packed kayak offers great stability allowing the paddler to gain confidence in the kayak quickly, the sharpe entry line and tri-form hull give the Moken 12 Angler brilliant straight line tracking abilities making it perfect for paddling on a range of waters. The Moken 12 Angler is feature packed with a large front storage area under a handy flip up hard hatch, along with a flip up lid on the mid console which is ideal for storing lures and gear you want close to hand. An 8" rubber hatch with mesh internal bag allows further storage inside the hull of this sit on top kayak, and as if that's not enough storage you also have the large rear tank well with bungee straps as well. It doesn't stop there either, the Feelfree Moken 12 Angler has 4 fitted flush mount rod holders 2 front and 2 rear all close enough to the brilliant seating position to make striking a rod easy. Solid molded side carry handles mean you can car top this sit on top simply, along with front and rear carry handles make things even easier if you happen to paddle with a friend. A wheel in the keel allows you to load the Moken 12 Angler with all your gear and wheel everything over hard flat surfaces. The seating position is perfect for both paddling and fishing and the adjustable foot rest allow the paddler to be in the perfect paddle position when on the water. Add any Feelfree sit on top kayak seat (sold separately) to the Feelfree Moken 12 Angler to give maximum comfort for those long days on the water, we would highly recommend the Feelfree Kingfisher Seat.